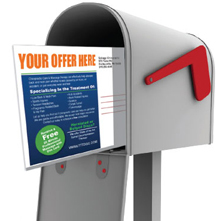 Every Door Direct Mail (EDDM) is the most affordable way to mail promotional materials to every address in your local area. Please leave a 4.25x2.25 box on the back of the design for the Post Office to apply the mailing addresses. and hundreds of other businesses that rely on walk-in local customers. The main difference between EDDM and direct marketing is that EDDM doesn't require any preparing of mailing lists. While when using services of direct marketing, you literary need to have correct names and addresses of clients where you want your advertising material to be sent, EDDM makes the entire process much simpler as you don't need to know any details of people who you are trying to reach. We do not do the mailing. We will print the postcards and once you have them, you can bring them to your local post office. You do not need to mail them all, you can mail a minimum of 200 at a time.